So I guess this could be a little more timely, since Sunday was the last day for the Florida Renaissance Festival in Deerfield Beach. 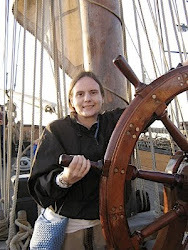 I visited it recently with my co-author Maggie Phillippi. I've been to the Arizona Renaissance Festival more times than I can easily count, and was interested to see how a Ren Faire a couple thousand miles away was! Quite a few things were the same--a surprising amount of hand-crafted merchandise (like necklaces and even those little shoulder animals) were basically the same. But a lot was different. Unlike the Arizona festival, Florida's is set in a County park. That means that you have to pay $1.50 a person just to park. Yes, seriously. I'd say on the up side that means you don't have to park in dirt, but actually, you park in...grass. Since the festival is in a park, the buildings and stages are basically temporary. Even the tickets look different than Arizona's! So yeah, once you are inside, there are a lot more tents than Arizona's, and a LOT more trees! Seemed to be a greater proportion of fried and fair-style food, but not sure. A lot more gyros than Arizona. Two more things you won't see at Arizona's fest--numerous signs, and WATER! On the other hand, some vistas in Florida are kind of wrong. For entertainment, we saw the Daredevil Chicken Club. Don't want to spoil the show for you too much, but that is a piece of banana in the air there. Unabashed silliness (and kind of gross). They had a musical version of Cinderella, which was rather unusual; I guess they do a different musical every year? Florida really IS another world; it was rife with additional Disney references, like Cinderella singing "Godmother, please" (to the tune of "Under the Sea"). After a brief bit of rain (just enough to make the benches wet!) we saw the falcon/hawk show, which was mostly the birds flying around randomly or being hooded while the man in charge told us all about falcons and hawks. Some of the information was interesting and some was repeated several times. Hawks attack animals on the ground, and tear them up so much that you can only use the remains for stew, whereas falcons neatly kill their prey. Falcons were the birds of the nobility and hawks were the birds of the common man, he said. And falcons and hawks only hunt when they're hungry; they don't hunt to refine their skills, like cats do. The Florida Renaissance Festival also had a "model pirate ship" that I'd expected to be somewhat larger. And fry bread (it felt wrong to eat fry bread in Florida for some reason). It was really crispy; I couldn't even finish it, even with Maggie having some! 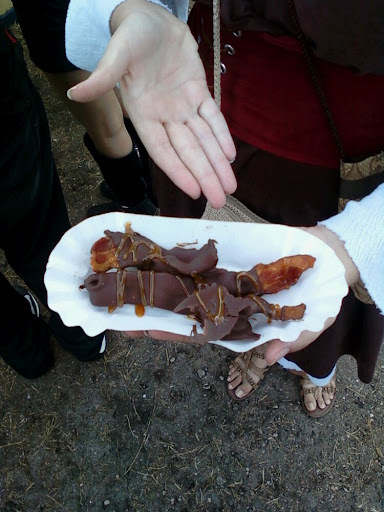 And later, this monstrosity (chocolate covered bacon!). It was cold and wasn't very good (and I LIKE crispy bacon! Maggie doesn't, so she didn't care for it at the start). The bacon and chocolate were both good quality, but they didn't go together. I think I ate a piece, just to say I did. But it did garner attention while I was holding it while we waited for Maggie's deep-fried Oreos (delicious!). Everyone wanted to know how it was, and someone advised me to call 911 in advance before eating it, just in case. The last thing--unlike Arizona's festival, Florida's has the greyhounds OUTSIDE instead of inside!